The MagConnect mounting system is built to help bridge the gap between your tablet and the environment you utilize it. Each mount is designed with a unique mount base to work in a variety of permanently fixed or temporary settings for both flat and round surfaces and across various industries. Each mount features a patented magnetic connector that makes attaching and removing the tablet rapid. The mounts are crafted of high-quality carbon fiber arms. This advanced material is surprisingly lightweight yet incredibly strong. The powerful combination of carbon fiber with carefully designed joints produces mounts that are both easy to maneuver and sturdy to use. This diverse line of adjustable carbon fiber mounts are designed to support select tablets such as iPad Pro, iPad Air 2 | Air, iPad mini 3 | 2 | 1, iPad 4 | 3 | 2, and Surface Pro 4 | 3. For the other tablets we offer our Universal MagConnect Tablet Module, so you can build a system customized to fit your exact needs. Paired with a protective enclosure these mounts are ideal for virtually any environment, but if you find you need some configuration assistance, you can always reach out to one of our knowledgeable product specialists and they will be more than happy to assist you. The MagConnect patent pending technology is advanced, but using it is simple. First, the tablet is secured into tray/enclosure. When the tablet holder is attached to a compatible MagConnect product, the powerful magnet on the mount instantly interlocks, while a precision screw can be tightened for a secure fit. MagConnect mounts are built of high-quality carbon fiber arms. This superior material is lightweight and durable. The powerful combinations of carbon fiber with carefully designed joints produce mounts that are both easy to maneuver and sturdy to use. 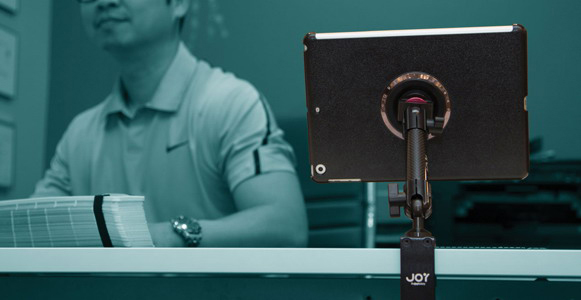 MagConnect mounts come equipped with two spherical joints for multi-angle positioning; one at the top of the mount where the tablet holder connects to the mount and one at the base. Each joint can rotate 360 degrees to easily position your tablet for optimum ergonomics thus reducing neck and back strain. MagConnect mounts that come with dual arms offer either a butterfly dial or a tightening lever to quickly position or reposition the mount to a more ergonomic preference. This additional feature on select mount types opens up a whole new dynamic to positioning.